Sign up below and see if you qualify for this Milk & Yogurt Study. If you do, you will be paid out $2.00 via PayPal. Allow 4-6 weeks for payment to process! E-Poll Surveys is an survey company that provides an online community where you can share your opinion and earn points. Use their interactive forum to share your opinion with companies who make products that you most likely use every day. Help shape the retail market by providing your review, and get rewarded with points that translate into cash and gift cards! E-Poll Surveys gives you a simple way to be able to join thousands of people like yourself in sharing your thoughts with companies that effect your life. It’s absolutely free to sign-up for E-Poll Surveys! They are also committed to your privacy, and won’t share your personal information with others. E-Poll Surveys makes giving your opinion fun! On top of taking surveys in the traditional format, sometimes you will be asked to watch a video, or even a television program, and give your opinion on it after it airs! It’s a great way to be an active part of what products find success or fail when they’re newly released. Taking surveys can be fun, but what’s in it for you? There are multiple ways to earn with E-Poll Surveys, multiple ways to win prizes, and multiple options for payout too! As we said before, signing-up is free and easy to do. Once you sign-up, you’ll be asked to fill out an initial survey and you will earn 100 upon its completion. After that, watch your e-mail for more invitations to complete future surveys. Make sure to pay close attention to your inbox, as sometimes surveys have participation caps, meaning they only allow a certain number of people to complete the survey, and once that number is reached, they won’t allow further participants. There are also monthly sweepstakes offered as well. Each month there are 50 winners of $20 each! By signing up you’re automatically entered to win. While points won’t get you much in the real world, you can cash them out through E-Poll Surveys’ reward center for Paypal deposits, gift cards, and even make a donation to a popular charity as well! Popular rewards are gift cards to hot companies like Best Buy, Game Stop, Starbucks, Amazon. 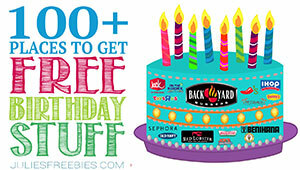 Walmart, Kmart, Sears, and more! 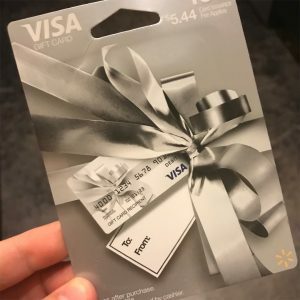 If you don’t prefer gift cards, but would rather have cold-hard cash, you can use your Paypal account to have your points turned into dollars and instantly deposited into your Paypal account! 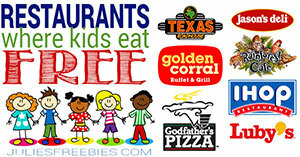 Rewards are given in amounts that vary from $5.00 – $30.00 increments. The points you earn in surveys varies depending on the length of the survey, and the amount of time it will take you to complete it. Points become worth more in value, the more you accrue. For instance, to earn a $5.00 reward, you will need to have 3,750 points, but to earn a $30 reward you only need 18,750 points! You do need a minimum of 3,750 points in order to cash out, so keep that in mind as you’re collecting points. When signing-up for a survey company, you should always be sure they are reliable and legitimate. E-Poll Surveys is a part of the BBB Reliability Program ensuring that your information is safe, and that you’ll receive your payouts as promised. They also have thousands of active users, giving you the assurance that they’re a company you should feel safe working with. 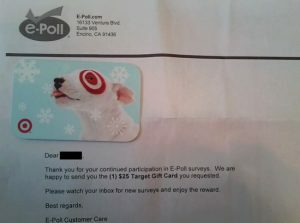 E-Poll Surveys have been around for ten years as of 2017, and are well known in the survey-taking community as a reliable source for income and rewards. Surveys are sent to your email after you sign up. E-Poll Surveys states that an average wait time between surveys that will be delivered to your inbox is anywhere from 4-6 weeks. They do state that sometimes surveys can come quicker than that, or that there may be gaps that are longer than 4-6 weeks as well. The frequency of the surveys depends on the number of users active in the program at the time, and the number of companies who are currently using E-Poll Surveys to gain information on their products. Your best bet to earn points quickly, and to receive more surveys in your inbox is to be quick to respond to the survey invitations and to complete them. Signing up is easy. You will need to fill out some contact information, including your email, to start the process. You can sign up HERE. Don’t worry, E-Poll Surveys promises that they won’t deliver spam to your inbox, and that your information is safe with them. Users have reported that they haven’t noticed an increase in spam emails since signing up for the service, so it seems like they’re committed to that cause. 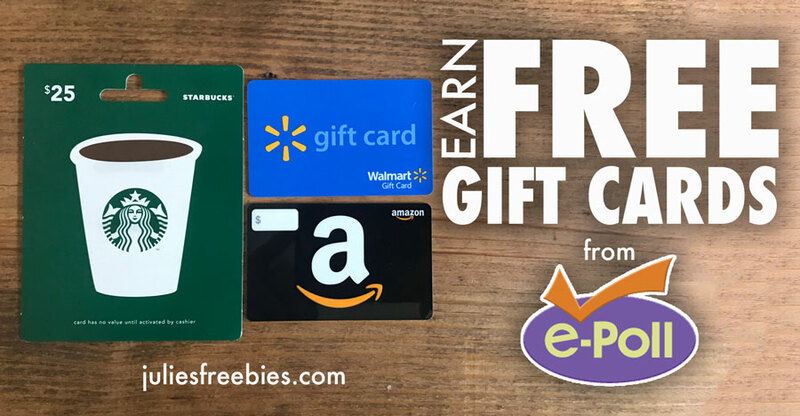 If you’re ready to begin earning cash and gift cards, and to give your opinion on new products and resources you use in daily life, then sign-up with E-Poll Surveys and start today! Looking to make some extra cash online with surveys but not sure where to turn. Pinecone Research is one of the top rated (and top paying) survey companies online! This company pays a MINIMUM of $3.00 per survey! In addition to surveys, this company also occasionally sends out products to its panelists to test out! You will get paid for your time if selected AND in some cases you get to keep the product that you are testing! If you are searching for a survey panel to join, this one is the best and comes highly rated! Don’t worry about minimums either, once you complete your first survey Pinecone Research will send you a check to the address you enter when you sign up! MAKE SURE YOU CONFIRM EMAIL AND COMPLETE DEMOGRAPHIC SURVEY to start earning! Humans have found a new way play on the old saying “one man’s trash is another man’s treasure”. It now goes something more like “one man’s trash is another man’s cash”. Dumpster diving is the term used for people who salvage a variety of products from the garbage of stores, apartments, etc. It is now becoming more popular for people to brave the unpleasant conditions of climbing into a dumpster to score some amazing finds and skip-out on expensive bills. Many people have are saving hundreds, even thousands, of dollars on goods, including hair products, high end makeup, clothing, and more, that would, otherwise, be very expensive. So how exactly are people making money off of diving into dumpsters? Well, first, you figure out what products you want to dive for. Makeup and hair care products seems to amongst the best finds and most popular around the heavy savers’ community. After that, you choose a store to begin your treasure hunting adventure. Figure out the store’s trash schedule. For instance, if the trash is gone by Wednesday morning then you should probably go Tuesday evening. Also, try to go after the store has closed to avoid possible confrontation with any staff. Now you take your great finds to an online platform where you can make some sales. Many people utilize Facebook groups that are specifically for dumpster diving supporters. Individuals who sell goods clean the products off, select those that are in good condition and list them in the groups for sales or trades with other members. Some other routes to take would be utilizing ecommerce platforms, such as Ebay and Craigslist to unload your inventory. Be sure to clean things thoroughly – some divers recommend rubbing alcohol and soaking in water – and being open and honest about your products. If you’re interested in stepping into the lavish life of acquiring some expensive items for zero the cost, there are a few things you may want to consider and be aware of before beginning. Make sure you check into the laws related to dumpster diving in your state. If you do happen to get approached by a police officer or staff of a store, it may be best to be honest and non-confrontational. Be careful while handling the trash and look out for harmful objects, such as sharp objects or chemical spills. You may want to bring some rubber gloves and face masks along, especially until you get the hang of it. Many companies have begun to cover their throw-outs in liquids and oils, such as lotions and conditioner, to discourage divers. This is known in the dumpster diving community as “soup”. Although it may be difficult to get through sometimes, don’t let it stop you from having success with your finds. Now that you’ve gotten a basic outline of how you can being your dumpster diving lifestyle…get to saving! Then, get to making money! Let us know about any tips, tricks or stories you have from dumpster diving. OneOpinion is a newer survey site that not only lets you earn gift cards for doing surveys, but they also will have upcoming opportunities where you can review products as well. Sign up by clicking the link, or read on for our full review! OneOpinion.com is a survey site that allows you to earn points in exchange for taking and completing surveys on different topics. Once you’ve reached 25,000 points you can exchange your points for prizes, gift cards, or cash. OneOpinion.com is one of the largest survey sites on the web, and has high overall ratings from its users. Joining is easy and only requires a couple of steps. The site will as for your first and last name, your address, gender, birthdate, email address, and will verify you’re not a bot by having you enter a CAPTCHA code. While this seems like a lot of information, it’s all necessary information they need for accurate survey data. Confirm your email address by clicking on the link in the email that will be sent to the address your provided upon registration, and you’re ready to begin your first survey. Each survey varies in its reward depending on the time needed to complete the survey. It seems a rough estimate for points awarded, is about 100 points per minute of survey. For instance, a survey that will take you about 40 minutes to complete, will earn you 3,700 points. You need a minimum of 25,000 points to cash them in for a reward. 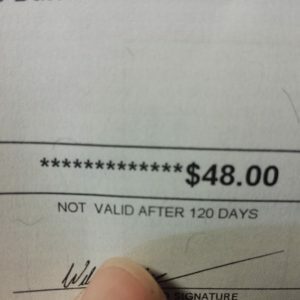 Many people voiced being able to cash in within two weeks of casual survey taking. This amount will vary from person to person, depending on how much time you have to devote to survey taking, and how consistently you use their site. OneOpinion.com offers a large variety of rewards and reward types. You can earn physical gift cards, which are sent to you via mail. 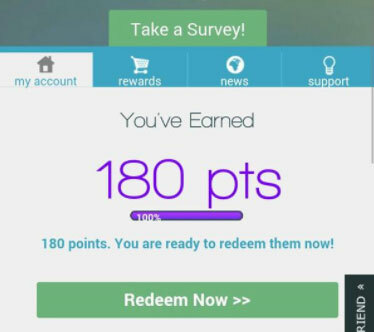 These gift card amounts start at $25.00, which also equals 25,000 points. Physical gift cards include places like Starbucks, Target, Walmart, Home Depot, and Amazon. You can also get a Visa Mastercard in varying amounts as well. If you’d like to opt to earn virtual rewards, that are gift cards delivered via email, then you need to fill out some additional information to be verified to do so. Some users reported being unable to be verified with no explanation. The majority of users sign up for this option with no issue at all, and report quick payouts. In addition to the Visa Mastercards you can redeem in the Rewards Center, you can also opt to receive payments via Paypal. You will just select the Paypal option in the Rewards Center, when you’re ready to cash out with a minimum of 25,000 points, and the money will be deposited into your Paypal account instantly. It should be noted that Paypal is in the virtual rewards section and is only available if you’ve been verified for virtual rewards. How long to surveys take to complete? While surveys can be upwards of ninety minutes long, many only take ten-fifteen minutes to complete. Most surveys will have an entrance survey that will determine if you meet the specific criteria to take the actual survey. Once you’ve completed the mini entrance survey, OneOpinion.com will tell you if you’re eligible to continue on to take the full survey or not. If you are eligible, you will complete the rest of the full survey and earn the full point amount. If you aren’t eligible, you will receive a small point amount in exchange for the time it took you to complete the mini entrance survey. Surveys vary every time. You may be asked to give your opinion on a new brand, or a new type of product that hasn’t been released yet. You may also be asked to answer just general questions about your life, your demographic, and your shopping habits. These surveys can help companies to understand their audience, and if a product will be received well before it’s even been released on the market. Some surveys may ask you to respond via video response, which will use your computer’s webcam. Be aware that this may pop up in any given survey without warning. These type of responses help gauge your initial response to the information given as opposed to a well thought out typed response. Are surveys the only option with OneOpinion.com? No. 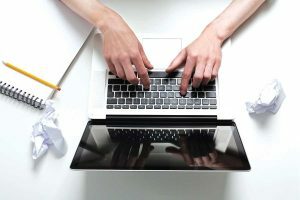 From time to time OneOpinion.com also offers product reviews. Upon approval that you fit the demographic needed to test the product, you will receive the product in the mail. In exchange for reviewing the product, after you receive it, you will get to keep the product itself, and also receive points as well. It’s a great way to find out about new products, and receive them before anyone else. This program is also subject to approval, when available, and requires that you keep the products and information attached to them, confidential, as the products are generally not available to the public yet when you receive them. 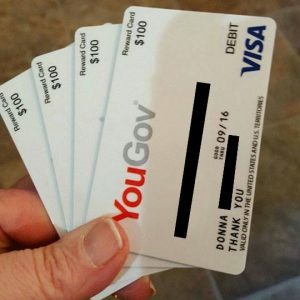 Sign up for YouGov panel and start earning cash and rewards. This panel is rated highly and offers rewards from Visa Gift Cards to Paypal to Amazon Gift Cards. This is a great way to start earning money for the holidays! Make sure you confirm your email on this one. I just found a new great way to make some easy (and passive) income. Its the Digital Reflections Panel. Take a short survey to see if you qualify, if so they will mail you a device to hook up to your internet at home. Installation takes 5 minutes and they will pay you $25 just for installing it. Do your first update and make another $25. PLUS you can earn $10 a month as well as bonus money every 3 months you keep it installed. Overall you can make $200 in your first year on this one (but you aren’t under any obligation to keep it for that long). Keep it as long as you wish! What is the Digital Reflection Panel? The Digital Reflection Panel is part of an online market research community with millions of participants worldwide. As a member, your household will contribute to the future of the internet by allowing Digital Reflection to collect information about your internet browsing and purchasing activity. This may include the content of web pages visited as well as your home’s wireless network activity, in order to better understand how, you, your household, and users of your home’s WiFi network interact with the digital world. 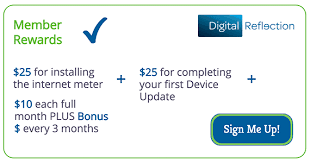 If you qualify, we’ll send you an internet meter to connect to your home’s wireless router. It takes 5 minutes to install and we’ll provide all the supplies and instructions you need. Once installed, the meter works automatically to collect information about how your household uses the internet. The information we collect will never be associated with you or members of your household, be in any of the reports we provide to our clients or be used for marketing purposes. Your contact information will be used only to send you information and rewards. Follow my instructions to get a FREE GIFT CARD. Cards are sent within 24 hours! 2. Fill out the registration form then answer a few questions to see if you qualify. Just 3-5 questions. You do need to have an Amazon Account to qualify for this one. 3. Install the app then use your Amazon Account to log in! You can repeat this every month. 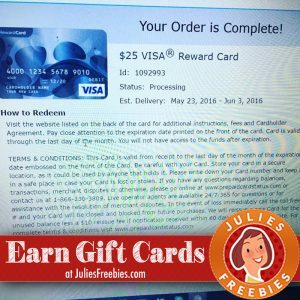 So you can get a FREE Visa Gift Card every 30 days! Summertime is often viewed as a time for fun and frivolity. It is a time when kids are supposed to let loose and enjoy the freedom of not being in school. However, summertime is also a great time for kids to explore being entrepreneurs. They can use their newly found free time to have fun AND earn money. 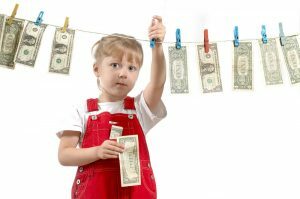 Here are a few cool ways your kids can earn money this summer. I know this probably seems a bit cliché’. A lemonade stand seems like the default summer business. However, just because something is common doesn’t mean it is a bad idea. People love a cold cup of lemonade – especially during the hot summer months. If you are worried about your child’s lemonade stand being one of many, you can help them brainstorm ways to stand out from the crowd.. For example, if you are on top of the legalities of getting a permit, you can secure a prime location to set up shop. The best places are ones that get a great deal of foot traffic. Your child can get creative with the lemonade flavors by adding in different fruits and herbs, such as strawberry, blueberry, mint, and rosemary. They can also offer edible treats to go along with the lemonade, such as cookies or brownies. A lot of people might be willing to pay kids to walk their pets, take them out to play, or even give them food and water if the family needs to go on vacation. As long as the pets are not aggressive and your child is old enough to safely handle pets, this can be a great way for your child to earn some extra money and show some responsibility. This could even become something that they can do beyond the summer months. Speaking of people going on vacations, some of your neighbors might be happy to pay your child a bit of money to take care of things around their home while they are gone. Especially if they are going on an extended vacation. For example, they might need someone to water the plants and garden, feed and clean up after any pets they leave behind, bring the mail in, and sign for any packages that are delivered. Another great way for your kids to make money during the summer (and year-round) is to offer to do yard work for people in your neighborhood or town. In the summer, they can offer to mow the grass, rake leave leaves, collect nuts and fruit that fall from trees, and even help to tend people’s gardens. In Fall, raking leaves will be even more important. Then, of course, winter is prime snow-shoveling season in many parts of the world. If your kids do a good job, they might be able to secure loyal customers throughout most of the year. It could become a legitimate and very profitable business. Finally, a fun way to make money and get rid of things that they don’t need is to have a yard sale. Your kids can go through all of their clothes, toys, books, and other belongings, and make a pile of things that they are willing to sell. They can do the research into pricing each item, setting things up, and even advertising the yard sale. If they don’t have much luck selling their things at a yard sale, you could also consider helping them sell their things online on websites like eBay or Amazon. These are just a few ideas of things your kids can do to earn a bit of money over the summer (and beyond). Do you have some money-making ideas that didn’t make the list? Feel free to share them in the comments below. 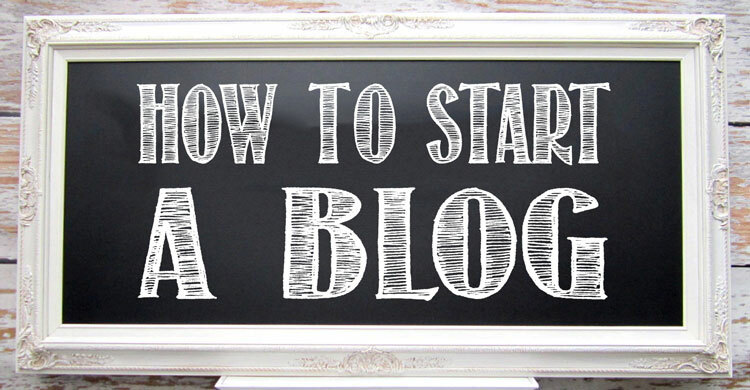 Starting a blog can seem like an overwhelming prospect but it is easier than you might think. Blogs are not only a great way to get free stuff, they are also a great way to make some extra income. In my case, this blog actually makes up the majority of my income. One of the nice things about blogging is that it is an industry where self taught people can succeed with ease. There is no blogging 101 classes in college, and schooling and degrees aren’t required as you are your own boss. The income potential and possibilities with owning your own blog are truly limitless. In addition to make money, you can also get tons of free stuff by owning a blog. Public Relation firms absolutely love bloggers getting the word out about their products. If you set up a review blog you can contact many companies and PR agencies and they will send over samples and often times full sized freebies in exchange for you posting a review on your site. 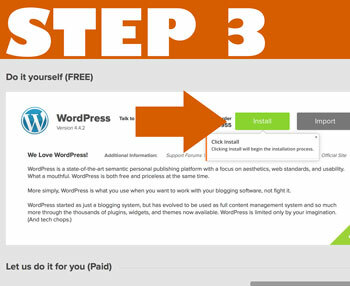 This is the first, and arguably one of the most important steps of setting up a blog. There are free services out there like blogspot.com or wordpress.com but if you want to be taken seriously, you are going to need a domain and hosting. When thinking of a domain, try to think of something that communicates what you are wanting to do while keeping it short. Get creative with this one, it will need to be unique. Once you have picked out a name for your blog, head over to Bluehost and click the GET STARTED button and search to see if your domain is available. I selected the basic package for my new blog (that is all you will need to get started). For my test domain to show how easy it is, I picked JuliesReviews.com. 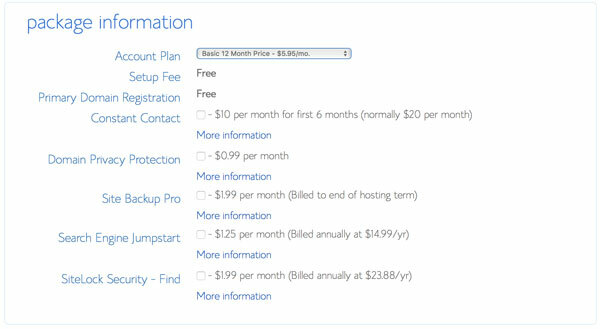 With BlueHost, your domain is completely free which is a nice bonus to get started with. Once you pick out the domain, you head over to pick out the plan you want. I picked the basic plan and opted 12 months at $5.95. They have pre-checked several items that they suggest you buy, but I unchecked them as I don’t think they are truly necessary. Right when you log into your new BlueHost account you will see this. Click on the Setup your Website button. It will prompt you to click a website button near the top of the screen, so click that. You will come to this page. 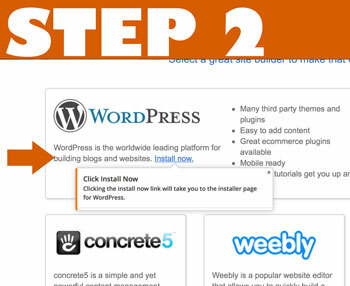 At the top it will say WordPress and tell you to click to install it now. Click on the Install Now button. It will take you to yet another page that looks like the image to the left. Click the Install button once more. 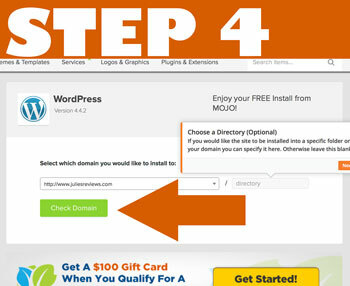 On this step it will ask you if you want to install to a directory and tell you its optional. Do not do it. Just click on the Check Domain button. Step 5 is the final step. 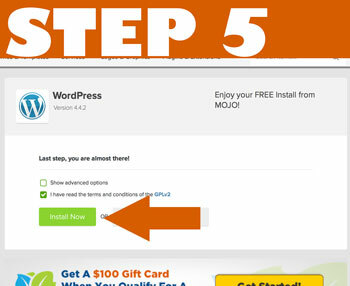 Here you will agree to the terms of the install and click the INSTALL NOW button. This is the part where your install will actually happen! YAY! You can click on your URL that is listed above and see what your new website looks like! NEAT HUH? Thats your little home on the web! Play around with it a bit and get to learn it, don’t be scared of it and remember to use Google if you get stuck somewhere. 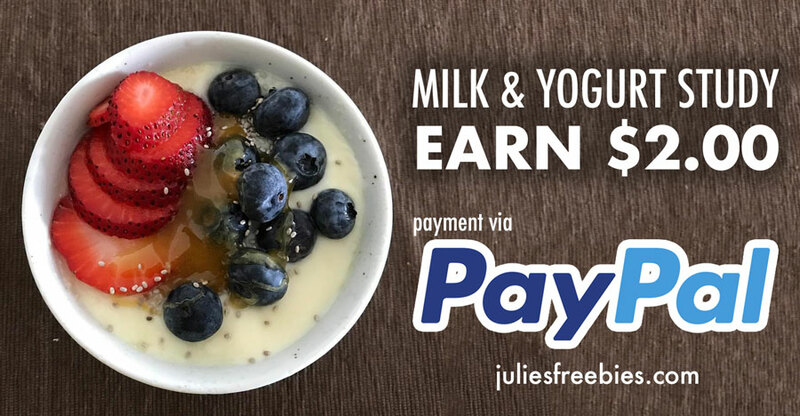 Millions of website online are powered by WordPress (including Julie’s Freebies) and it is relatively easy to use. One of the first things you might want to do is click where it says “Setting” on the left hand side and then click “General” Here you will be able to change the name of your blog. I just changed mine to Julie’s Reviews. The tagline is a line of text that is a very short overview of your site. I changed mine to Julie’s Reviews and More. Be sure and scroll down to the save button and then visit your sites homepage again so you can see the changes. In the image above I have added red marks to show you the basics on creating your first post. Put a title, write the post and then you can click the Add Media button to add images to your post (it will give you options for editing the images and aligning them in that Add Media button). 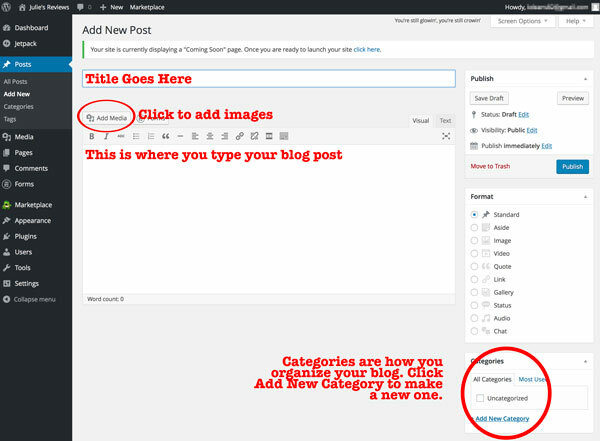 Once you make your first post and create a category for it, then click on PUBLISH. 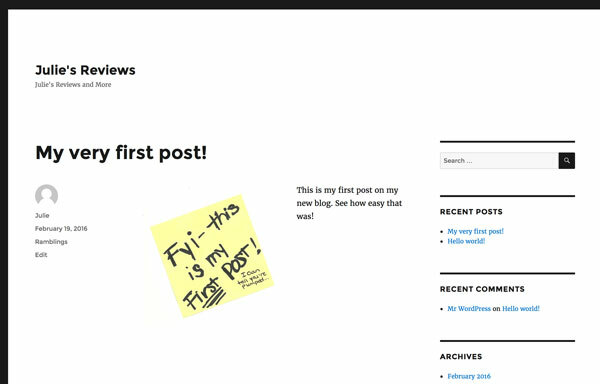 Once you click publish, then click View Post at the top look what you created! Your very first blog post! Play around with your blog, including with the themes. 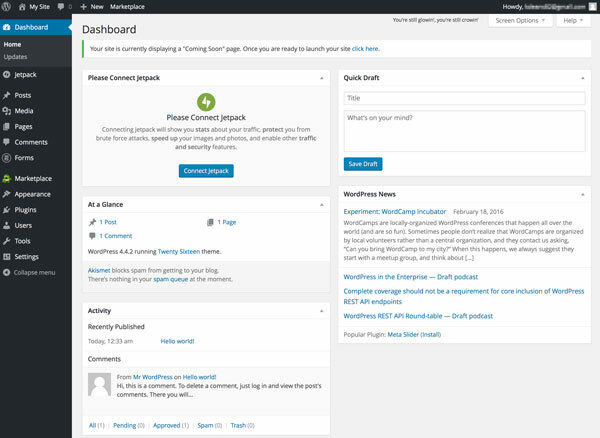 There are a few different themes that come with wordpress, and you can always find new free ones to easily add to your wordpress installation and play around with. Would you like more information on blogging? Let me know in the comments what you would like to see! I hope to make this a regular section of my blog! Love Free Stuff? Want to make Money? Blogging could be for you! If you love getting free stuff and you are interested in making some extra money, blogging could be just what you are looking for. I have asked around several times on my site for bloggers that would be interested in helping me out, but what I frequently hear is that a lot of people are interested in blogging, they just don’t know where to start. Companies and PR firms LOVE bloggers. Bloggers help get the word out about new and existing products and most PR firms and companies are willing to send out samples to bloggers to try and review! A lot of the time they send full size products out too! Know your way around a computer – You should be comfortable with photos, images and files. Know your way around Google – You should have the ability to search Google with relative ease. Literally everything you could need to know about any aspect of blogging is just a search away. Patience – Starting a blog does take some patience to get it growing. Social media makes networking so much easier than it used to be though, and with a twitter and Facebook account you should be able to find other bloggers! Domain & Hosting Costs – You can get started with a domain AND a year of hosting for less than $100. BlueHost is a WordPress recommended hosting company and you can sign up with them for as little as $71.40 for your first whole year! 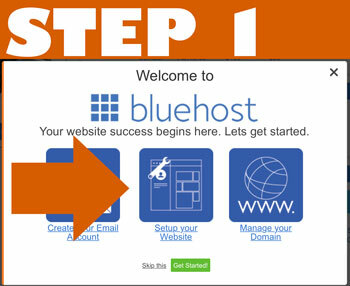 In addition, BlueHost offers 1 click WordPress installation so there is no need to worry about any coding! Start out with some filler content on your blog – Write about products that you already have or have tried. Post photos with the product and and describe what you love about the product. BE HONEST! Being honest in your reviews is necessary to keep readers coming back! Posting a few initial posts and reviews on your blog will show companies that you have done some reviews and give them an idea of what your posts and reviews look like. Email companies you like or companies with products you have been wanting to try – Look for a contact us form on websites of companies whose products you are interested in. Contact them, let them know that you have been wanting to try their products (let them know some specific ones, it will show them that you know their product line) and tell them why. 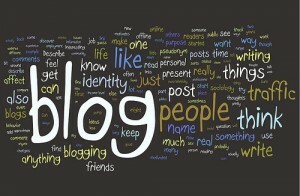 Mention that you have a blog. You can go ahead and include your address in the first contact. Many companies are busy, and this might make things go a little faster for them. Friends and Family is always a good start. Let them know on your personal social media channels that you are starting a blog and you would love for them to follow along. Keep in mind, not everyone may be interested in becoming a reader. If you decide to mainly review makeup, chances are the males in your family aren’t going to be interested. Know your potential audience. Social Media – When you sign up make sure that you also sign your blog up for a Facebook page, Twitter, Pinterest, Instagram, Youtube etc. All of these sites can be really great sources of traffic for your blog. Once you get signed up for social media for your blog (free by the way). You can find similar followers and follow them and hope they follow you back. If you search on Facebook there are also some groups for bloggers that you can become a part of (I am considering starting one) and you can help each other out by liking each others social media. Long answer – Posting on a blog is relatively easy. I like to say that if you can update your Facebook status and post photos on Facebook then chances are you could probably blog. The hardest part of blogging is finding an audience who is interested that will become loyal readers. Is it really that profitable? – It can be. Not everyone is going to stick with blogging or grow an audience to the point where they make money, but there can be great rewards for those who hang in there, and give it their all. Blogging successfully is not something that happens over night. It takes some time to get your rhythm and to build up followers. There is no real classes for learning to blog, it is very much learn as you go. When you have a question, search google for the answers or reach out to some blogging groups on Facebook to ask others for help. I’d steer clear of classes that want to teach you how to blog for a fee. All of the information that you need to become a successful blogger is available with a quick web search. Looking to earn some extra cash or some gift cards? Sign up with Opinion Outpost. I asked Julie’s Freebies readers about what their favorite survey sites were, and Opinion Outpost was mentioned over and over again. Sign up below, confirm your email and start earning! Get entered to win $10,000 just for signing up! Make sure to CONFIRM YOUR EMAIL. Check out some of what our readers said below for tips, and feel free to add your own! 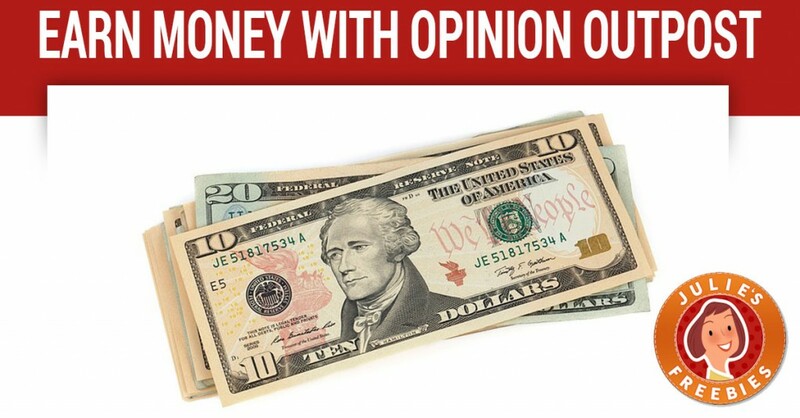 Amanda Y. has been a member of Opinion Outpost for 3 months and has made $131! She says that she has done quite a few survey sites and this one is her favorite because it is straight forward and isn’t confusing. Complete your profile – This will help you get matched up with surveys. Surveys hit their limits fast, so when you get an email for a survey, act quickly! They do a lot of product testing and you get to keep the product. She did one for a coffee maker and got $5 along with the product! Never rush through a survey. They will disqualify you if you rush! Read everything, sometimes they put in trick questions to make sure you are reading! Weekends are harder to get into surveys because there are more people online trying for them!